Atlona Technologies released three custom installation testing kits, saving both time and overhead. 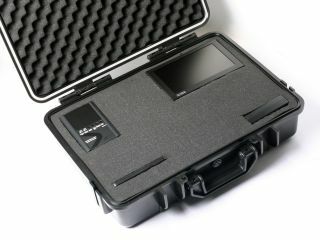 The AT-KIT-HD1, AT-KIT-PROHD2, and AT-KIT-PROHD3 kits combine an HDMI signal generator and seven-inch HDMI monitor in a Pelican case, while the AT-KIT-PROHD3 also features the AT-HDSync HDMI EDID emulator and AT-BAT-DIS7PRO monitor battery. "Now more than ever, integrators are looking to lower installation costs without sacrificing quality or reliability. To meet this need, we are very excited to introduce our new installation testing kits, which combine the proven Atlona testing products that our customers have come to rely on into one bundled solution to lower costs," said Ilya Khayn, president of Atlona Technologies. "Atlona kits are offered in three versions so our customers can choose the features they need, without paying for those they don't." The AT-KIT-HD1 features the AT-DIS7-HD, a seven-inch testing monitor that recognizes any HDMI or DVI source at resolutions up to 1080p, and allows users to observe both audio and video signals in real time. The compact display allows users to view signal information such as High-bandwidth Digital Content Protection (HDCP) compliance, resolution, frequency, digital format, and audio information. The AT-KIT-PROHD2 and AT-KIT-PROHD3 kits are bolstered with the AT-DIS7-PROHD seven-inch testing monitor, which recognizes any HDMI, DVI, VGA, or component video source at resolutions up to 1080p or 1920x1200. The AT-DIS7-PROHD can also be used to test 3D sources.